The French call it nonpareil, or "without equal." 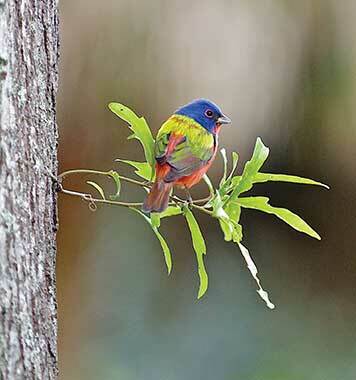 South Carolina backyard birders agree that the painted bunting's brilliant plumage deserves the compliment. Lifting up his head, Steve Pittman gazes out of his home-office window. On the other side of the glass, painted buntings eagerly fly in to feed or await their turn in the surrounding low trees and shrubbery, part of an ingenious setup Pittman has created for bringing the colorful birds right up to his window. An admirer of the gloriously multihued buntings, Pittman works from his St. Matthews home in part so he can enjoy this springtime view. He says that catching the flash of a bright blue head, green and yellow back and red underparts makes the slight inconvenience of working from home worthwhile. To add to the fun, Pittman works on the side as a professional photographer and loves capturing "PBs" (as their devotees call them) on camera. "Probably the photo I've had to work the hardest for," says Pittman, "is this one of a painted bunting perched on a tiny branch growing from the tree just outside the window. I'm in sales, and I remember I was working on a pretty important deal when I saw this particular bird fly in. I held the phone in one hand and supported my camera, resting on a roll of paper towels, with the other. 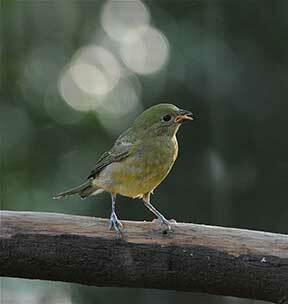 The camera was clicking fast on the painted bunting while I wrapped up the sale." Pittman and his wife, Mary, use a clever strategy to encourage the sparrow-sized birds to visit his office window that relies on creating the right habitat. "When the birds fly in to our feeders, they'll usually light on the bottom branches of the low-story dogwood under the big oak, on low branches of the oak itself or on a nearby holly tree," says Pittman. "They scope everything out and then move to the wire roosts we've supplied. Finally, they go to the feeders, which we've filled with white millet, a favorite food for them. It's a step-by-step process that allows the birds to ease into the area. This staged approach to attracting PBs works well for us." Not far from Pittman's home, retired DNR staffers Ann Nolte and Hank Stallworth also enjoy playing hosts to a fair crowd of painted buntings. Beginning with a few herald PBs, the birds will commence their annual return to the couple's yard in January, a week or so before they show up at Pittman's house. 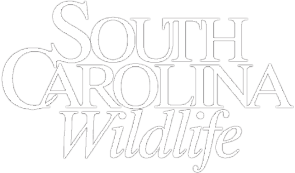 January, Stallworth says, is a pretty early return date - the bird's spring migration to South Carolina typically begins in early April, with autumn departure to their wintering grounds in Florida, Cuba or Mexico beginning in mid-September. These January birds, muses Stallworth, may have overwintered and are just visiting the yard for an easy feeder meal. Today, S.C. Department of Natural Resources wildlife technician and avid birder Lex Glover has set up banding operations on the wrap-around porch of Nolte and Stallworth's farmhouse home. As he works, Glover recalls the fall morning he banded forty-two painted buntings here. At the moment, he's weighing and banding a "greenie," or "green bird," the terms used for females and immature males, both of which are wholly yellowish green and hard to tell apart. "One thing we enjoy," says Stallworth, "is seeing the birds that return from year to year. It's like greeting old friends. We know they're ours because they're banded and we have records of their individual banding patterns. Sometimes, we can even recognize them by idiosyncrasies in coloration." Nolte tells about a friendly neighborhood PB rivalry she took part in: "Not long ago, we had a little contest here in Calhoun County between some other gals and me to see who would get the first PB. I saw one on January second or third, so I won. But I've seen them even earlier. In December 2005, I was home with a terrible flu, stuck upstairs for about three weeks. I was looking out the window of my son's bedroom, and there were green birds on the patio. My last sighting is usually mid-October, so with these early arrivals I have PBs nearly year-round." After the 2005 sighting, Nolte really started paying attention to her PBs. 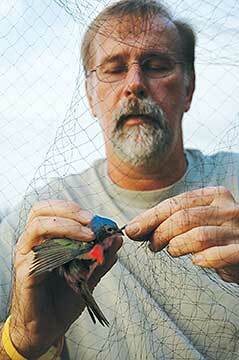 At the time, Glover had just started the Painted Bunting Observer Team with Dr. Jamie Rotenberg at the University of North Carolina, Wilmington, and the new organization used the Nolte-Stallworth property as a guinea-pig site to do some initial banding in summer 2006. Later, the team expanded its work to coastal sites in the Lowcountry. Concerning her observing work, Nolte explains, "I generally watch our painteds through the spotting scope from my kitchen window. The scope allows me to see the bands, so I can identify individual birds and record sighting information. In 2011 I had the excitement of observing the return of a male who had been banded in 2006 as an after-second-year male, so we knew he was at least seven years old. The average PB life span is only three to five years, so this sighting was pretty exhilarating." According to Glover, while the coastal areas of North Carolina, South Carolina, Georgia and Florida still host the largest eastern populations of breeding painted buntings, the birds have begun traveling inland to breed due to habitat loss along the coast. He reports some surprisingly good news, given this loss of habitat. 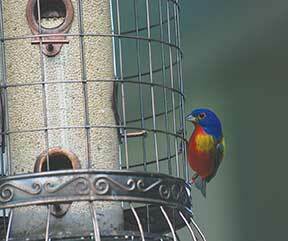 "In South Carolina, we have a very healthy population of painted buntings," says Glover, "about thirty-five thousand birds. The population hasn't really declined here. At one time, we thought it had, but the baseline data from our survey shows otherwise. Our state is unique in that our birds come well inland. They are now in the Columbia-Lexington area, possibly even farther north than that, and they are extremely successful inland." Painted buntings are common in Orangeburg and Calhoun counties, he continues, because the birds favor the large, open agricultural areas prevalent there. They especially appreciate the scrub growing up where woodland meets field. People who'd like to attract buntings but don't live in heavily farmed areas can try providing a backyard setting as close as possible to the birds' usual habitat, which may at least attract some migrating birds. Gary Phillips of Conway writes a birding and nature column for the (Myrtle Beach) Sun News and seconds Glover's emphasis on the importance of shrub-scrub habitat for attracting buntings. "For several years, I did a lot of private bird guiding and led public birding trips," says Phillips. 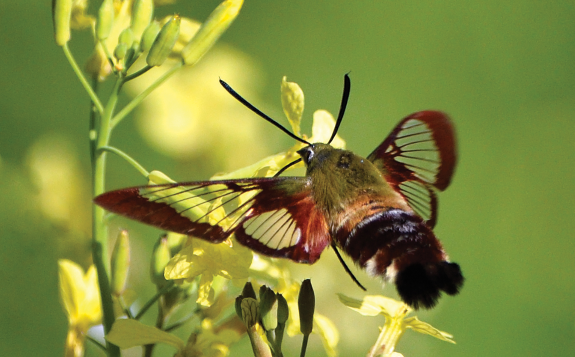 "I was speaking somewhere once, describing PB habitat, and a lady in the audience raised her hand to say, 'So you're telling me my backyard is too nice for buntings?' I said, 'No, ma'am, I'm telling you that from a PB's point of view, your yard's not nice enough.' Evidently, she had a manicured city yard. 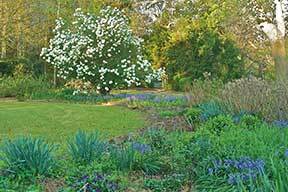 You have to be willing to leave at least some of your yard in a more natural state to attract PBs - a few pine trees, live oaks, redcedars, a few shrubs for cover, lots of grasses that produce seeds for food and so forth." When he was in his early twenties, painted buntings gave Lex Glover two gifts: a close-up look at a rare behavior and a confirmation. Before he started working with the DNR, Glover was already an avid birder but had never encountered a painted bunting close-up. 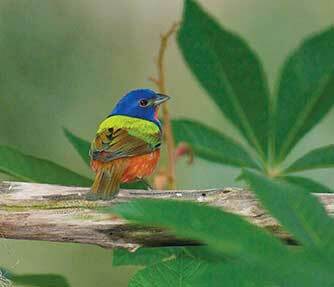 On a walking visit to Huntington Beach State Park, he saw a male and a female bunting on the edge of the causeway road. The male was hopping around the female in a sort of dance, looking like a funny little wind-up toy. The experience, which remains one of his favorite moments in birding, reinforced for him the knowledge that he was heading in the right direction for his life's work. Ann Nolte has observed this same behavior and grins when she thinks of it. "The male fans his wings and twirls around and does his little dance for about half a minute," she says. "The female sits and watches him. I've seen the routine twice, once right here on our patio." 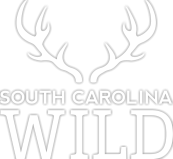 Marion Clark of Lexington, president of the Carolina Bird Club and twenty-five-year volunteer ranger-naturalist with the Mountain Bridge Wilderness Area, notes that his specialty DNR license plate featuring a painted bunting gets a lot of attention. 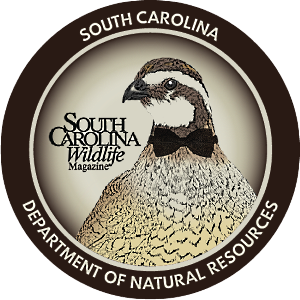 As a PB enthusiast, he displays that license plate proudly and also notes with satisfaction South Carolina's listing as a hot spot for PBs in the National Geographic Guide to Birding Hot Spots of the United States. Along with a multitude of other PB-watching friends, Marion waits eagerly for the springtime return of these colorful birds. And, yes, they're back! Where Can I See Painteds If I Don't Live Near Them? 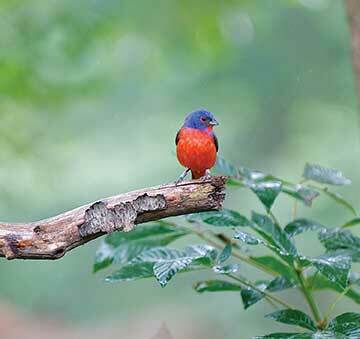 Bill Hilton Jr., executive director of the Hilton Pond Center for Piedmont Natural History in York, hosts no painted buntings on his property, but he's found an easy way to view them on visits to the South Carolina coast. 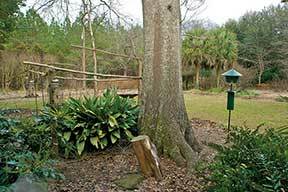 "Check the feeders at Huntington Beach State Park's nature center, and you'll see painteds there," says Hilton, "but I've seen the most PBs at front-yard feeders on the first row of houses all along the Grand Strand. If you just ride down the beach road slowly and look for rental houses and private dwellings with feeders in the front yard, quite often, if there's a little bit of shrubbery, there'll be painted buntings eating at the feeders." Rosanne McDowell is a Columbia-based freelance writer and editor who also serves as resolution writer for the South Carolina Legislative Council. 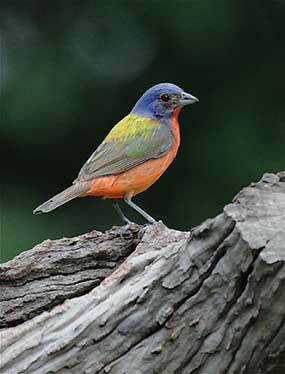 If you spot a banded painted bunting, please contact Lex Glover at gloverl@dnr.sc.gov or (803) 419-7747.